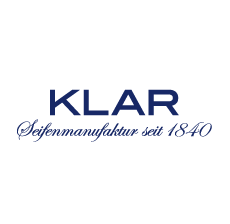 Klar's soap for women nourishes with pure vegetable oils from organic farming. Preserves delicate skin from drying out. Refined with a fresh, floral fragrance. Decorated with a design from the Klar Soaps advertising from the 50s.